I’ve been a PGA professional going on 15 years and during this time how we teach our students has evolved. When I first started the swing had a large emphasis on rotating the club face through impact. This was done by opening the hands and therefore the clubface during the backswing and the closing the clubface during the downswing and impact. The goal was to square the clubface at impact to your intended target. Drills, like kissing the forearms and spearing the bag, were very popular drills for hand release. These drills, however, aren’t used as much anymore in the modern era. Hand release can lead to inconsistency as the acute ways we can move our hands can always change from time to time. There is also a timing issue so that we don’t release too early or too late. Additionally, hand release isn’t always done correctly by most amateurs and can lead to contact, accuracy and furthermore plane issues. Despite the timing issues, this method is very useful for those who lack the range of movement. When performed correctly a correct hand release can help trap the ball and generate extra velocity through impact that can enhance added distance. To perform a timely release, your grip must be fundamentally sound. A sound grip is something that has been documented for centuries, but I believe the most important aspect is the placement of the palms. Changing a grip can be a very long and arduous task. Players often get frustrated with inconsistent shot patterns because of it. To help this I want everyone first to know where the clubface is during the swing. This is hard to do as there is usually no reference and the clubface is far too far away from you to gain the appropriate feedback. However, if you place your right palm (right handed golfer) on the side of the grip facing in the same direction of the square clubface at address you have a better sense of where the clubface is during the swing. This can lead to a better-executed hand release for a straighter ball flight. When shots fly left or right you can trace it back to where the palm was at impact or during the downswing towards the ball. Hand release is a good way to improve the enjoyment for less mobile golfers and a good way to focus on a more fundamental grip. The grip is essential to help gain feedback of how you are releasing the clubface. If adopting this method try and put in scheduled range sessions and avoid improper hand release. 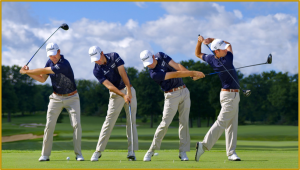 Now body rotation is harder to do for less flexible golfers or those with limited movement. I suggest trying some of the drills highlighted to help increase the ability to rotate and with added practice this may help the suppleness of the body and could lead to more movement and consistency. 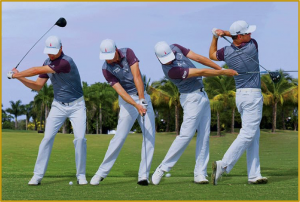 With increased body rotation you should be able to promote clubface rotation using the body which can lead to more consistency. 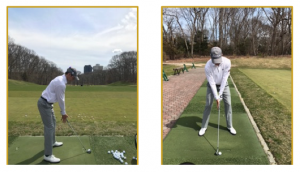 Even though the body is responsible for clubface in body rotation a few players and teachers have introduced body rotation while the clubface never leaves from facing the target. This is the opposite from hand release as the clubface remains closed during the backswing and opening after impact (toe down to toe up). It can be a very effective and sometimes more consistent method, as your focus is to rotate the body rather than both the body and clubface. You can see in the pictures below how this looks, and I believe that this method could change how clubs are fit in the future. With both hand release and body rotation, the grip is still an essential part of any technique to enhance clubface squareness. I hope that by implementing either of these techniques you will be able to square up the clubface more throughout the swing and raise the level of your game. For more help on your game please feel free to check out my blog by clicking here.